Only 14 reviews onto the blog will have reached 1000 reviews total. Not too shabby if I do say so myself! What better way to keep the ball rolling than by bringing in another Wii game with a very dubious reputation. I’m talking about none other than Billy the Wizard. While the game may not be able to keep his name straight, I have to give it some major kudos for actually being fairly original. The parts that aren’t an obvious Harry Potter rip off anyway. The idea of 3D races while on broomsticks is actually quite impressive. It’s just a shame that the gameplay mechanics weren’t quite up to the challenge. There is no story mode here so don’t get your hopes up too high. Honestly, you should always go into a Wii review with very low hopes since I have played most of the good ones by this point in time. You have 4 different modes to choose from and each one has 6 stages in it. That’s not a bad start right? Well, the first mode is tutorial. It’s actually fairly challenging to beat one of the final levels in that one, but I pulled through. Not a bad way to start off the game I guess, but by then I had already realized that the controls were completely and utterly terrible. Unlike Super Kart GP, this one insists on using the nunchuk as well. Big mistake. Just about everyone who owns a Wii likely remembers how sad and insulting the Nunchuk was to fellow gamers. It was basically Nintendo’s way of hitting us while we were down because the motion controls weren’t emphasized as much, but it didn’t matter because the nunchuk was still a bad controller. In this case, the nunchuk is still mainly used as a motion controller, but you still have to use the Wii Remote as well. They both help with turning, but it’s awful confusing and you’ll be scratching your head by the end. Racing is virtually impossible and from the 4 modes, that was the only one that I couldn’t beat. Forget about beating all 6 races, I couldn’t even handle the first one. It’s insane just how difficult it is. You can’t simply race to the finish line. You have to also go through every ring in the level and missing one is fatal so you can’t go too fast. The problem is that the other racers are travelling at full speed at all times, which gets rather dicey. They won’t just pass you, these kids want to watch you squirm. What I mean by that, is that they will blast you with energy attacks. You can fire back as well by waving the Wii remote, but that doesn’t always work so well while racing. You can imagine how easy it is to run off the track when something like that occurs. I ultimately had to choose not to fire anything, but then I’d lose regardless. The races are definitely the worst part about the game and the irony is that this is technically a racing game. The third mode has you flying around to collect books. You merely need to pass through all of the books scattered in the level in order to complete it. With a compass and how well lit the stages are, this is a breeze. It may have been on the easy side, but at least it was fun and not tedious. Billy finally scored and the final mode was also fairly decent. This one was about blasting Dragons away. You just had to spam your energy blasts and hope that they landed on the dragons. It beat a few levels with only seconds to spare so this one was definitely quite tricky. Just keep on blasting and when in doubt, blast some more. It will ultimately help you out and the dragons won’t stand a chance. The cover art is really misleading so I feel like I should warn you about that. The back hints that you get to have a really cool totally 3D race that looks like something out of a Mario Party minigame. Unfortunately, that is simply not the case. The picture is actually taken from one of the loading screens and cropped appropriately to trick the audience. It’s what the game does…and it does it well. I guess the developers were willing to do just about anything in order to sell a few more copies. Graphically, this game will fail to impress you. The dragon doesn’t really look like a dragon. I’ll give the landscape some mild props I suppose as it doesn’t look all that bad. It needs some work, but it’s not as bad as it could be. The soundtrack is terrible though as the main theme is officially overused. It’s quite telling when games like Madden…which aren’t exactly known for their great musical selections, have a more energetic song list. Most of the songs are quite sad so you need to definitely take this on a case by case basis, but at least they put in some effort over there. I couldn’t feel any effort with Billy the Wizard. I suppose you could say that there is a reasonable amount of replay value here thanks to multiplayer mode. Playing with a friend is always better than playing by yourself in a game like this. It won’t make the game worth 20 dollars or anything like that, but it can slightly help the game out in the long run I suppose. It’ll have to do at any rate as this game won’t really be offering you anything else. Overall, Billy the Wizard is exactly what you would expect when you check to see who made the game. The company has always set the bar low and then they crawl under it. While the gameplay is fairly unique, there’s nothing really positive to say about it. The execution simply wasn’t handled all that well at all and you’ll be done with most of the game’s content in roughly an hour or so…probably much sooner. If you want to play a racing game, go and play F Zero GX. That game had hype, presentation, and good controls. Billy could learn a thing or two from that title. 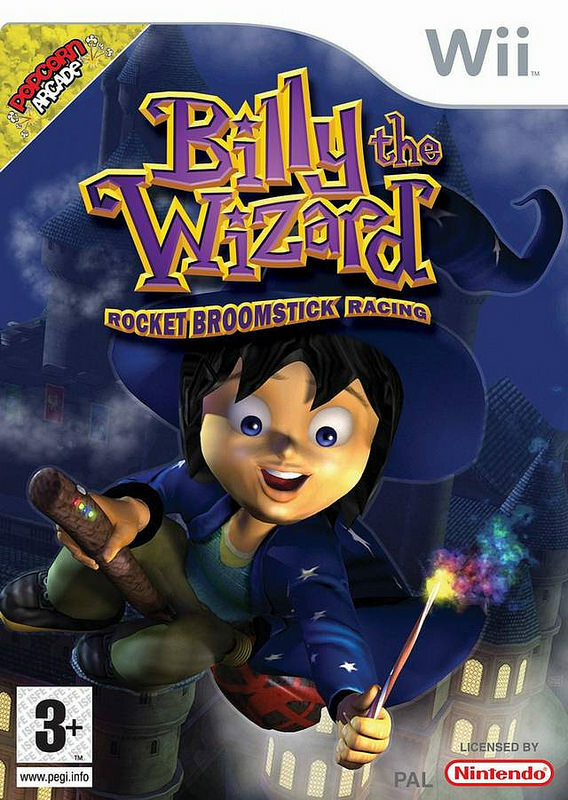 This entry was posted in 4 Star Games, Game Reviews, Games, Reviews and tagged Billy, Billy The Wizard, Dragons, Game Review, Glitchy, Nintendo, Racing Game, Review, Rocket Broomstick Racing, Video Game Review, Wii by dreager1. Bookmark the permalink.